MacBook Pro features Intel’s fifth generation Core architecture. A high performance graphics processor delivers incredible performance levels and high-speed Thunderbolt I/O lets you transfer data at rates up to 10GB/ps. Buy the Apple MacBook Pro 15" online from Jumia at the best price in Nigeria. When you pack so many pixels into a display over 4 million on the 13-inch model and over 5 million on the 15inch model the results are positively stunning. The pixel density is so high, your eyes can’t discern individual pixels. Images take on a new level of realism. A spectacular 2560-by-1600 resolution on the 13inch MacBook Pro and an equally impressive 2880-by-1800 resolution on the 15inch MacBook Pro let you see more of your high-resolution images with pixel-for-pixel accuracy. And text is so sharp, you’ll feel like you’re reading email, web pages, and documents on a printed page. The Retina display reduces glare while maintaining incredible colour and quality. Its high contrast ratio results in blacker blacks and whiter whites. And everything in between is rich and vibrant. IPS technology gives you a wide, 178-degree view of everything on the screen, so you’ll see the difference at practically any angle. And you’re going to love what you see. With the fifth-generation dual-core Intel Core i5 or Intel Core i7 processor, the 13?inch MacBook Pro with Retina display lets you take your most performance-hungry apps on the road. That means wherever you can take your camera, you can take your entire digital photo studio. Hyper-Threading technology, which enhances performance by letting each core handle multiple tasks simultaneously, is included in every model. And with speeds up to 3.1GHz, shared L3 cache up to 4MB, and Turbo Boost speeds up to 3.4GHz, these processors are ready for just about anything. The 15?inch MacBook Pro with Retina display has the power to do even more amazing things. Fourth-generation quad-core Intel Core i7 processors let you make quick work of even the most complex tasks in professional apps like Final Cut Pro X, thanks to speeds up to 2.8GHz, 6MB of shared L3 cache, and Turbo Boost speeds up to 4.0GHz. And every model comes standard with 16GB of superfast memory. All of which means the 15?inch MacBook Pro is ready to take on whatever you can dream up, wherever your travels take you. The 13-inch MacBook Pro with Retina display features Intel Iris Graphics 6100 to handle both everyday tasks and graphics-intensive creative apps. Scroll through large photo albums with ease. Play games with amazing detail. Even connect an external display or two. It’s just another way this 13?inch MacBook Pro is small on size but big on performance. The 13-inch MacBook Pro lasts up to 10 hours between charges. And the 15?inch model lasts up to 9 hours.1 That’s an hour longer than previously for each model. And they deliver 12 hours and 9 hours of iTunes movie playback, respectively. That’s impressive battery life for any notebook. But for a high-performance notebook with an ultra-high-resolution display, state-of-the-art processors and graphics, and a superslim design, it’s absolutely remarkable. The built-in battery gives you up to 1000 full charge and discharge cycles. Up to 10 hrs Wireless web.Up to 12 hrs iTunes movie playback. Thanks to the superfast read and write performance of the PCle-based flash storage, you’ll notice a difference in whatever you do. Starting up is really fast, apps launch quickly, and navigating the desktop feels fluid and responsive. The 13-inch model features flash storage speeds of up to 1.6 GBps that’s 2 times faster than the previous generation, letting you import huge photo libraries in no time flat.2 On the 15-inch model you get up to 2.5x faster flash storage3 with up to 2.0?GBps throughput that works with quad-core processors and high-performance graphics to make quick work of even the most demanding Final Cut Pro X editing tasks. And since these MacBook Pro models come with up to 1TB of flash storage, you can keep all your important files with you.4 In addition, flash has no moving parts, so it’s superdurable and quiet. Thunderbolt 2. The world's most advanced I/O. Whether you choose the 13?inch or 15?inch model, you’ll get two Thunderbolt 2 ports, two USB 3 ports, an HDMI port, an SDXC card slot, and a headphone port. So in a matter of minutes you can build an entire professional studio with MacBook Pro as its centerpiece. Dual built-in microphones are great for when you want to be heard. If you’re making a FaceTime call, for example, the mics reduce background noise from behind the notebook. And when you use Dictation, they create an adaptive audio beam that intelligently adjusts to detect your voice instead of the noise around you. Make your point with greater clarity. Centered just above the widescreen Retina display on MacBook Pro is an advanced FaceTime HD camera, with an image sensor that produces accurate colors and reduced image noise even in low light. The sophisticated image processor produces sharper images and reduced motion blur. And the face detection feature automatically adjusts exposure and white balance to complement your face and skin tone, so you always look your best no matter what lighting is behind you. Founded by Steve Jobs, Steve Wozniak, and Ronald Wayne on April 1, 1976, to develop and sell personal computers. Apple Inc. is an American multinational technology company headquartered in Cupertino, California, that designs, develops, and sells consumer electronics, computer software, online services, and personal computers. Its best-known hardware products are the Mac line of computers, the iPod media player, the iPhone smartphone, the iPad tablet computer, and the Apple Watch smartwatch. Its online services include iCloud, the iTunes Store, and the App Store. Apple's consumer software includes the OS X and iOS operating systems, the iTunes media browser, the Safari web browser, and the iLife and iWork creativity and productivity suites. 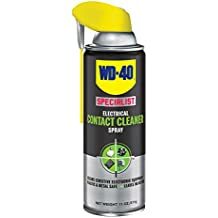 WD-40 Specialist Electrical Contact Cleaner Spray, 11 oz.